You’d think that it was a good thing for Mikuru to spend a whole episode unconscious, but she makes painful Gooto Yuko sounds in her sleep. Clearly the most annoying thing about this program. I no longer care that they didn’t immediately conclude the “Remote Island Syndrome” story, because this was infinitely better. It’s not so much a side story as it is an actual complement to the series, and hey! Look at this! Haruhi isn’t the heroine after all! So, we’re all well acquainted with the fact that the main story of The Melancholy of Suzumiya Haruhi is being stretched across this series, with stories taken from other books in between. Judging by the preview, this two parter won’t be resolved until the episode after next! You can’t leave us hanging on a fluffy murder mystery, folks: it’s just fluff, after all! I’ve laid low on writing about this episode of this top secret show because I needed time for my non-existent evil plans to come to fruition. Actually, this is really good stuff right here that even justifies the existence of Mikuru and her godawful voice, and for that I am grateful. It’s just a pity that the real world so significantly dampened my enthusiasm for this adventure. Remember, folks: she’s not the messiah, she’s a very naughty girl. 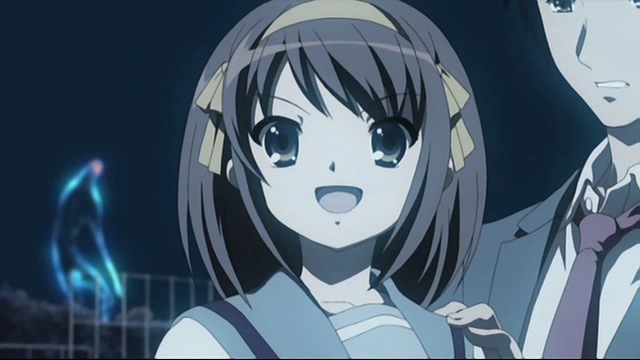 The concept of Suzumiya Haruhi revealed at last!